Apples are plentiful and cheap this time of year so it is time for an apple dessert. OK, we have all had apple crisp but when I was growing up, I loved apple crumble. 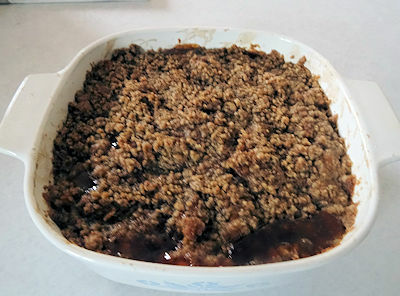 Apple crisp usually has oatmeal in the topping. Apple crumble is flour, butter and sugar made into an almost cookie like topping. I love both but a crumble takes me back to my youth. 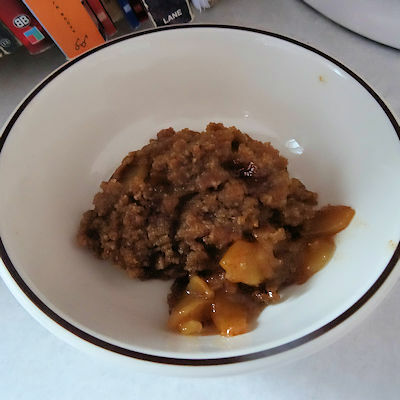 One of the great things about Apple Crumble is how easy it is to make. Slice 8 cups of apples into an 8 inch square casserole dish that has been sprayed with baking spray. Mix the fruit topping ingredients and spread them over the apples. Gently stir to coat the apples. Mix the crumble ingredients together with a pastry blender until it is a crumbly mixture. Spread it over the surface of the dessert. Bake the crumble for 40 to 45 minutes, until the top is browned and the filling is bubbly. Let it sit for at least 10 minutes before serving. It can be served with whipped cream or ice cream but the cookie type crumble makes it rich all on its own. This is one of my favourite desserts. The sweet/tart apple filling with the crumble topping is like having a combination of apple pie and cookies. Please try this! Put apples in an 8 inch square casserole that has been sprayed with baking spray. Mix the fruit topping ingredients together. Sprinkle the fruit topping over the apples and stir gently to coat the apples. Mix the crumble topping ingredients together with a pastry blender until crumbly. Spread the crumble topping evenly over the apples. Bake for 40 to 45 minutes, until the topping is browned and the filling is bubbly. Let sit at least 10 minutes before serving. I’ll take a bowl, please! 🙂 Great, easy recipe David! Thanks, Connie. It is one of my favourites. I would love to have a bowl of this apple crumble. Looks delicious!! That is very kind, Dawn. It is tasty.